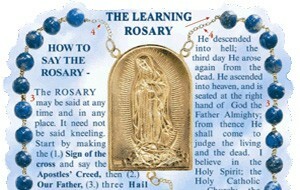 The Learning Rosary has been completely re-designed to include the new Luminous Mysteries, as announced in His Holiness John Paul II’s Apostolic Letter, Rosarium Virginis Mariae, in 2002. The Luminous mysteries, along with the traditional rosary meditations of the Joyful, Sorrowful, and Glorious Mysteries in the life of Jesus and Mary are intended to enrich the traditional Prayer, not to replace any part of it. Use this Learning Rosary as a tool for teaching others how to say the rosary. It is particularly useful for young students, the sick or elderly, new Catholics, or those confined to institutions. The graphic representation of the rosary, along with the contoured edges, make it an ideal tool for those who benefit from a tactile learning environment. The durability of the plastic and the convenience of the flat shape are also ideal for use in teaching the rosary to large groups in remote areas and for everyday use. The rosary measures 3 7/8″ wide x 8 3/4″ long. It is made of durable PVC plastic. The plastic is translucent when held up to light, yet the prayers and instructions printed on both sides are clearly readable.